Esta página é atualmente um esboço. Mais informações e discussões sobre mudanças neste esboço podem estar na página de discussão. Citar menu: The "Citar" menu or button is used to add inline citations (also called "footnotes" or "references"). All projects have access to "Básica" reference formatting and the ability to "Reusar" citations here. 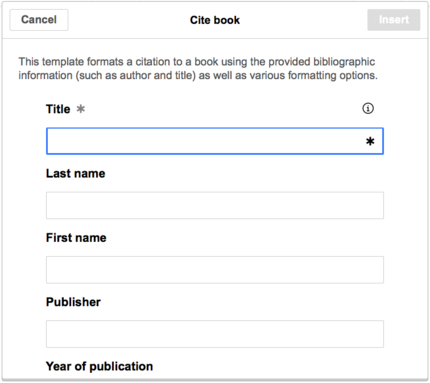 This menu also gives you quick access to local citation templates and the citoid automatic reference filling service, if these are enabled on your wiki. The "Predefinição" icon (a puzzle piece) allows you to insert and edit templates. The "Lista de referências" icon (three books) opens a dialog in which you can specify where will references be displayed to the reader. Usually this only needs to be done once on every page. To edit an existing reference, click on it where it appears in the text (usually as a bracketed number). You will see either a "Básica" icon (bookmark) or an icon (and name) for the template that was used to create this reference. Clicking on this icon will open a dialog where you can edit the reference. If what appears is the "Básica" icon, clicking on it opens the Reference dialog, where you can edit the reference's contents. If a template was used and you've clicked on information in that template, then the Predefinição icon (puzzle piece) will appear. Click on that icon to edit the content of the template in the template mini-editor dialog. If, instead of the "Básica" icon (bookmark), what appears when you click on a reference is an icon for a standard template for citations, then clicking on that icon will take you directly to the template mini-editor dialog. Inside the template mini-editor, you can add or remove types of information or change current content. Only fields (template parameters) that have content are supposed to be shown initially. To add fields, click on "Adicionar mais informações" at the bottom of the mini-editor. Click on "Aplicar mudanças" when you're done. To re-use an existing reference, place your cursor in the body of the text where you want to add a new reference (number) for that citation. Then click on the "Reusar" item from the "Citar" menu. In the Referência dialog, look at the list for the reference you want to reuse, and select it. If there are many references, you can use the search box (labeled "Buscar dentro das citações atuais") to list only those references that include certain text. To add more parameters, scroll down in the template mini-editor and click on the "Adicionar mais informações" option. Click on "Inserir" when you're done. Shown here is what you will see if you select the "Básica" item. In the Reference editor, you can add your citation, including formatting. In the Reference dialog, if you want to include a template in your new reference, click the Predefinição icon (puzzle piece) in the "Inserir" toolbar menu within the Reference editor. After you're done editing your new template, click on "Aplicar mudanças" to return to the Reference editor, and "Aplicar mudanças" again to return to the page you're editing. Place the cursor where you want to display the references list (usually at the bottom of the page), open the "Inserir" menu and click the "Lista de referências" icon (three books). The final step in the References list dialog is to click "Inserir". After you're done editing the template, click on "Inserir" to return to the Reference editor, and "Inserir" again to return to the page you're editing.